Mayor Scott Galvin is pleased to announce the appointment of veteran police officer Robert F. Rufo as the City of Woburn’s new Chief of Police. 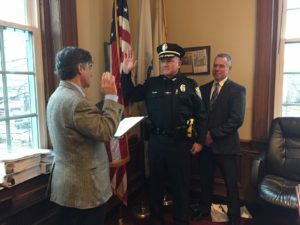 Rufo’s role as Chief follows 35 years of committed service to the well-being and public safety of his hometown—earning his way up the ranks in leadership roles throughout the Woburn Police Department. Chief Rufo was born and raised here in Woburn, where he still lives and is a familiar presence in our community.